Nicholas Joy, age 17, from Medford Massachusetts, was last seen Sunday March 3 at 12:40 PM on the Sugarloaf Mountain Timberline Chairlift by his father. He and his father had been skiing together all morning. High winds and poor visibility caused the 17-year-old skier skier to lose sight of the trail and become lost in the dense woods of Carrabassett Valley, Maine. As light faded he constructed a snow cave and drank water from a nearby stream. 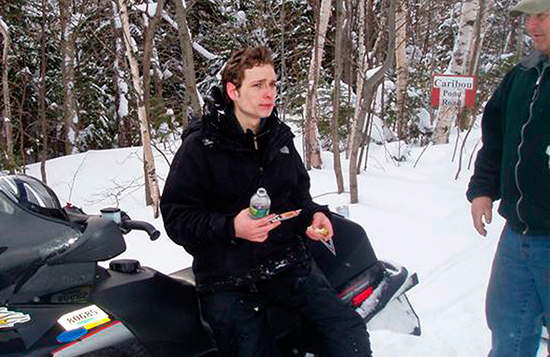 He spent two night is the frigid weather until he followed the distant sounds of sleds and was discovered by Massachusetts snowmobiler Joseph Paul on Tuesday. Paul, a Warwick Fire Department captain has a camp nearby, had decided to search the area for the missing teenager. Paul found the skier at 9am and shared some peanuts and crackers he was carrying on his snowmobile. The Portland Free Press has additional details.